Before you call a heater technician for a furnace that won’t turn on, it’s a good idea to make sure that the problem isn’t easily solvable. Oftentimes, the issue is as simple as a unit that’s turned off, a tripped breaker, or a blown fuse. Sometimes the issue is as simple as your electric furnace being off. Perhaps you went on vacation and turned it off, and you simply forgot to turn it back on. In other cases, a power outage may have caused it to turn off, and it simply didn’t turn back on once power was restored. Check your furnace for a reset button, and see if pressing it fixes the issue. Occurrences such a power outage or power surge may trip your breaker. Check your furnace’s breaker and turn it back on if it’s been tripped. Of course, if your electric furnace keeps tripping the breaker, this is likely a sign of a bigger issue. Your electric furnace’s fuses will eventually burn out. If you examine them and find that one or more are burnt or broken, replacing them may be all you need to do to fix the issue. If you try all of the above and your electric heater still won’t turn on, then it’s time to call in an experienced heater technician. 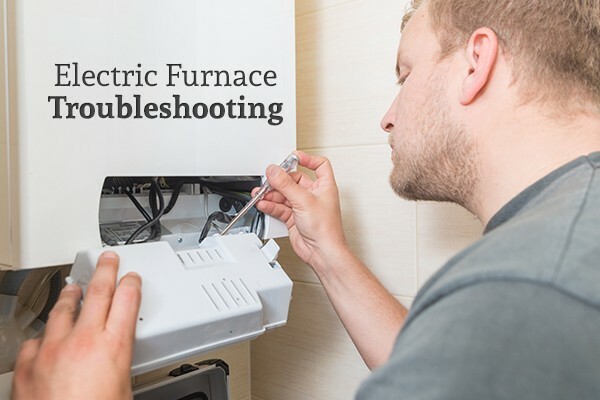 If your electric furnace is running but doesn’t seem to be producing enough heat, it could be caused by the thermostat being on the wrong setting, a clogged filter, dirty air ducts, or a major issue with the furnace. Electric furnaces have their own thermostat that dictates how much heat they’ll produce. Sometimes, their thermostats are simply set too low. Try raising the thermostat 3-5 degrees (Fahrenheit), and then see if your heater starts producing enough heat. Your furnace’s filter needs to be cleaned or replaced every so often. If you check the filter and it’s clogged with dust and debris, then a simple replacement/cleaning may be all you need to do. A lack of heat coming from your furnace may be due to a fan that won’t turn or a broken blower. These issues are usually not DIY fixes. Other common issues that prevent your home from heating up include a faulty heating element or dirty air ducts. These issues – or any other major issues with your electric furnace – should be taken care of by a licensed heater technician. A blower that won’t stop running is often caused by one of two issues: your thermostat on the wrong setting or a faulty relay. If the blower won’t turn off, it could simply be that your thermostat is set to ON instead of AUTO. Check the setting on your thermostat and see if you need to adjust it. The other common cause of a blower that won’t turn off is a faulty relay. This is definitely not a fix that you should try to do yourself. A noisy furnace may be due to something as simple as a loose access panel or something more complex such as a problem with the belt. Over time, your electric furnace’s access panel may come loose. If it seems like the banging is due to this issue, try tightening the bolts on it and see if that works. Your furnace has a belt that helps it run. Oftentimes, a noisy electric furnace is caused by a belt that’s loose, has come off, is unlubricated, or is broken. You may be able to fix the issue yourself – just make sure to turn your furnace off first. If you’ve tried one of the simple steps outlined above and your electric furnace is still not working right, it’s time to call in Cote’s Mechanical. Their licensed and experienced heater technicians will discover the cause of the issue and get it fixed for your promptly.